Oranges are high in vitamin C.
How much vitamin C is in an orange? This is a great question and one that most people don't know the answer to. 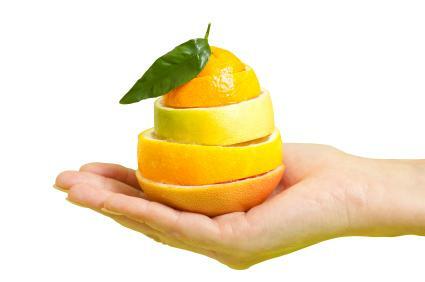 Since cold and flu season is right around the corner, make sure you get enough vitamin C by eating an orange everyday! So, How Much Vitamin C Is in an Orange? How much vitamin C is in an orange, anyway? To be exact, there is 45 mg of vitamin C in your average orange. This calculates out to about 75% of your total requirement for the day. While this may seem like a lot, you may consider taking more vitamin C than is your daily requirement during cold and flu season. While too much C can cause digestive upset, taking a tablet of 1000 mg of vitamin C twice a day can help boost your immune system and keep sickness at bay. While your average orange has 45 mg of vitamin C, different oranges raised in different growing conditions can account for slight variation of nutrient content between individual fruits. So an organic orange may have more vitamin C than a standard orange, or an orange grown in one state may have more C than an orange grown in another part of the country. As with any other nutrient, it is always a good idea to talk to your doctor before taking massive amounts of any sort of supplement. If you're getting your vitamin C from oranges, though, odds are it will not be enough to overload your system. That's another great reason to get your vitamins from food -- it's very difficult overdose! Even if you drink five glasses of orange juice a day, you would still be nowhere near the amount of vitamin C that would cause problems with your body.